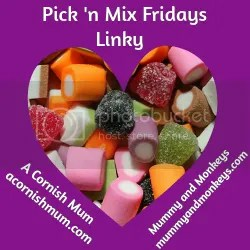 Hi there if you haven’t been here before welcome to Pick ‘n Mix blogger’s linky run by myself and Stevie at A Cornish Mum. Any post on any theme is welcome, old or new. We also now have a special badge for those of you who get chosen each week as mine or Stevie’s favourite post for the week. Entirely up to you if you want to display it, but if you have been chosen as a favourite post before, or are in the future, then feel free to display this badge on your site. My favourite post from last week who can grab the badge above if they want was Back to School – the benefits by To Maternity and Beyond. A very funny and also very true post! Go and have a read. We previously changed it to make sure everyone got at least one visit and comment other than mine and Stevie’s ones, by saying that you should comment on the blog post before yours. Please make sure you are doing this when you link. Remember though, that even if you don’t get many visits or comments from people through Pick ‘n Mix click throughs, we do retweet you which helps to get your blogs out there to others. My Twitter followers are over 6500 at the moment and joined together with Stevie’s you will be retweeted to over 18500, and if you get chosen as our favourite blog from that week you get a shout out on the next week’s post including a follow link. Each week Stevie and I will be stumbling half each of your posts that you link up as well, so that’s even more exposure for your blog. If they have already been stumbled we will give them a like. Comment on the post before yours, and as many other posts as you have the time to visit. Use the #PicknMix on social media and when commenting so that others know you have a Pick ‘n’ Mix Fridays post for them to return the favour and read. Feel free to tag us in your post tweet @MummyandMonkeys and @stevie_couch for a retweet, again use the #PicknMix. "Styling the Blue Yumi Pleated Dress from House of Fraser"